Update your entire room at one time with the Madison Park Essentials Cadence 24 Piece Room in a Bag. This intricate paisley design features vivid shades of gold and brown on a brown base for a cool look in your space. Four decorative pillows use embroidery and fabrication to create the perfect finishing touches to the top of bed. Four window panels in corresponding grey create the perfect balance for the two valances in matching bedding fabric. Four tie backs, two euro shams, and a bedskirt use the gold and rich brown hues to coordinate all these pieces into one cohesive look. This 24-piece Room-in-a-Bag includes panels(4) and valances(2) for two good-sized windows. You will need a double rod to install. The fabric is polyester and washable with a lovely sheen and a satiny feel. I like that one of the square pillows (small) is the same fabric as the two rectangular shams so that it can be put in between them to fill in the extra space across the headboard that, for some strange reason, is the norm for shams. Someday a manufacturer will come up with two shams that actually fit the width of a mattress perfectly. I would have liked the comforter slightly larger in width and length, but especially in the length. I purchased a queen-sized set for a normal-height mattress, and it barely covers the sides of mattress and definitely would not cover an extra-deep mattress. If you like to turn the sheets down over the comforter, you could eke out several more inches at the bottom. You should definitely measure your mattress height, width and length and see if it matches the size description online. There are two great big shams included that I'm not sure what to do with. The color of "cadence blue" in this set is really more of a bluish-green mist; so these BIG shams are bluish-green on one side and a slightly lighter taupe (than the rest of the taupe in the set) on the backside where the opening flap is. I decided to use the taupe side of these shams to cover the areas near the lower part of the headboard/mattress that are not covered by the comforter. The bed skirt is the type with a full piece of fabric that goes under the mattress; so...if you like the elastic type, this is not it. With a little creativity, it's a lovely look for a master bedroom. I love this item because it includes a lot of beautiful items in one bag. The bedding is high quality and exactly the color and style as described. It comes with curtains, valences, decorative pillows and a thick comforter. It really pulls the room together. I love the colors in this set. However I do find that the comforter is a bit on the small side for a queen bed. Everything arrived in perfect condition and early. I just wish the comforter had been a few inches longer and wider. Just as beautiful as in the picture. The comforter tends to snag fairly easy. We returned this. The comforter did not fit our California King size bed. We were so disappointed. The colors matched our room perfectly. After doing some research I found that California King doesn't mean much anymore, there's a few different lengths and widths. We need a comforter that hangs over the sides of our 11 inch high mattress, and covers the sheet underneath. We'll be spending about *** more for a better fitting, better quality comforter with only 4 pieces. Wow I was very surprised at how soft the sheets were. Even the comforter is easy to sleep with (I like to use my comforter, not just for decor) The curtains were long and the decorative pillows and shams are very nicely sized. finally everything fits my CA King bed! Good quality. Product is as described and fit and finish are excellent. I will have these a long time. This was my very first purchase on Overstock. A big leap of faith, due to unknown exact colors and quality. Let me just say I am very impressed! It is more than what I expected! I've never seen such a huge collection of items packed so beautifully into one bag before! 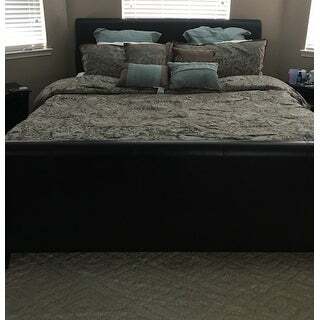 It is a really luxurious looking and feeling comforter and it is so much warmer than my older but infrequently used comforter we were making due with until I found exactly what I wanted. I had to remove one blanket from underneath the comforter and might even remove the final blanket. It is that warm! The price was incredible! I did a quick online search and found this at Kohl's but at a much higher price so I ran over to take a quick look in person. Of course only a display comforter was found. The colors are perfect and exactly what I expected. I am so happy I ordered this set. And it is machine washable. My only "complaint", if you will is the sheets are kind of odd in feel and in use. But they definitely work. But I forgot sheets were included, so extra points for having the entire set up in one bag, needed or not. My husband was even impressed with what I picked out and said it was a really nice look. As someone mentioned, it will most likely snag, but who cares? The price is so good and it is so beautiful, I will gladly use it risking snags and all. That is what beautiful items are for - using! I love this bedding set! I haven’t been able to put up my curtains but the bedding set is gorgeous and comfy. I bought it not only because of the great price but because of everything that was included and it’s definitely as pretty as in the pictures, highly recommend! Love, love, love the colors the brown and light blue is magical for my bedroom. The matching panels and pillows was a bonus. The quality of the sheets are slightly thin for my taste but the entire package makes up for the sheets. Fabulous product. This comforter set is gorgeous . The colors are so vibrant and really stands out. The quality is great. I’m a very happy and satisfied customer. I would purchase again for sure. Its not like the other items I’ve purchased before. This Bed In A Bag is gorgeous. Classic colors, a fine selection of pillows and window treatments. Than surprise you can flip it over and have a solid colored bedspread. The price point is incredibly low. Now I can afford to get another in a different color scheme. It's amazing how a different bedspread can change everything in emotion. I love this comforter set it looks great in my bedroom. The colors are beautiful the curtain panels were more sheer than I was expecting but beautiful craftsmanship looks great! Love it. It’s lovely and durable! Hoped it would have been softer, but it'll work. It's oh so beautiful!! I love the color. It has all the pieces needed for the entire bedroom. Wish it had 2 valances per window. The browns and blues are stunning together. Rich looking fabric. Only thing I would change is the amount of fiber fill in the comforter. Wish it was fuller. I would like to be able to order more curtains and valances that match what I have. I did order valances and they are slightly different so I am using them in the master bath. The only difference is they have a border on them. The color and pattern are exact. 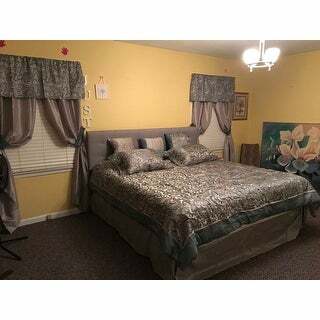 It is a wonderful comforter set and the added extras are a real bargain. I would have paid at least double the price retail. I would recommend this product, I am very satisfied with the set. "Where can I purchase an extra curtain? I have 3 bedroom windows." "The picture appears to be blue but the description says teal. Which is it?" "Do you have a shower curtain that matches the colors of this comforter set?" Unfortunately no, a matching shower curtain is not available. "What bed is that on display?" Unfortunately the bed on display is not available. "Can I purchase the comforter, shams and bed skirt without the panels for the wall-we do not need those but do like the comforter? Is this possible and what would be the cost of that. I don't want to pay $ and then have to give the panels to someone since they are not usable (Sp/?) in our bedroom. Please let me know as I am very interested in the comforter, shams and bed skirt. Thanks so much"
I want the entire package including the lamp. Is there a possibly of getting 2 lamps to make the set complete? "If I needed another window treatment, how could I purchase one? I am in love with t His pattern but don't know what I willl do if I can't get another window treatment,"
This item is not available separately. "Are there two sets of window dressings?" Yes, there are two sets of dressings.